This week we have experienced “technical problems” with two HYIP programs. One of which was quite well-recognized among investors. Whether these programs are really having technical issues, or they are shortly turning into scams, we will see shortly. Meanwhile, let’s take a closer look to one of the latest rivals on DavidNews.com monitor. 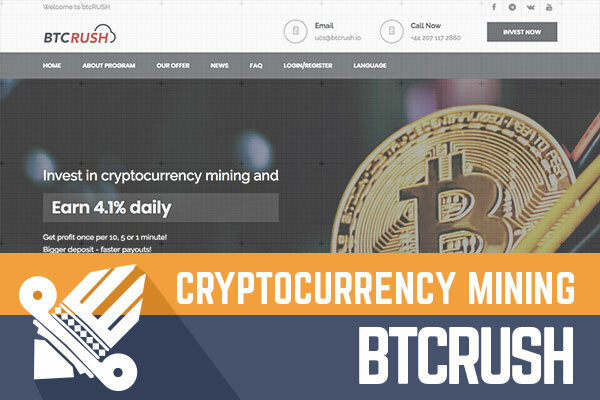 BtcRush is another cryptocurrency mining inspired program. It has been online for 8 days in total, but it joined Sticky Listing on DavidNews.com monitor on March 14, 2018. Currently, it has the status “PAYING”. I have reinvested $360 in the program and will keep you updated about the payments status on DavidNews.com monitor. Admins point out that the program it as ideal for everyone – both the new investors and the crypto-currency business sharks. Let’s take a closer look what BtcRush is really about! Like few other cryptocurrency mining inspired HYIPs, BtcRush offers a lifetime investment plan. At BtcRush you have only one investment plan option with 4.1% daily interest. Deposit is not included in this interest rate. In fact, you can withdrawal your deposit any time for a 5% fee. The minimum deposit is $5 (PerfectMoney, AdvCash), 0.00500000 BTC, 0.05000000 ETH, 0.05000000 LTC, 0.05000000 DASH. And there is no maximum deposit limit. The minimum withdrawal - $0.10000000 (PerfectMoney, AdvCash), 0.00010000 BTC, 0.00100000 ETH, 0.00100000 LTC, 0.00100000 DASH. Withdrawal requests are processed mainly during the business hours several times per hour, on Sunday's withdrawals are processed once per several hours from 10 AM till 6 PM. The withdrawal processing can take up to 3 business days. BtcRush accepts the following payment systems: Bitcoin, Litecoin, Ethereum, Dash, PerfectMoney, and AdvCash. What else is interesting about this program? The frequency of profit accruals - accruals are charged by equal parts every 10, 5 or 1 minute! I assume it might be addictive for some investors, but it kind of gives the feeling of extra safety. Keep reading to find out more about BtcRush and its main characteristics. So, BtcRush is the second cryptocurrency mining inspired program I am reviewing this week. 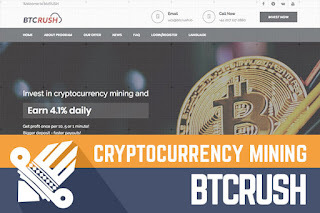 And exactly like the other program, the main marketing message of BtcRush is – a simple and fast-earning cryptocurrency mining without the need for mining equipment and specific knowledge. I have said many times before that there is some reason why such legends sound more credible due to current cryptocurrency rush. The legend of BtcRush itself is quite generic, focusing on constantly growing demand in the industry and reliable mining partners. As their main selling points admins highlight - SegWit protocol support, high-tech computing equipment, no commissions and optimization of investments. Feel free to read the full legend of the BtcRush if you are interested. According to best principles, there is also a separate page about the team of BtcRush. In case the story about “a group of scientists of different directions united by the faith in cryptology” doesn’t seems too thrilling to you, watch the videos to learn more about the program and the revolution of cryptocurrencies. I have noticed that introducing the team is becoming a trend in the HYIP world! Looking for more information how BtcRush is going to make a profit from deposits? Learn more about BtcRush mining farms in three short videos. Of course, It is always up to you to believe if this all is true or not. But thumbs up for the effort! In terms of the website – I would call this one a good example of HYIP websites. Simple, yet contemporary design, not too much not too less information, everything a potential investor might need – calculator, FAQ, etc. Admins have thought about users all around the world – the website is available in six languages. The User dashboard is functional and quite interactive as well – not the standard HYIP dashboard! Another thing that might be interesting for potential investors - a 7 Day quests. If you have made a deposit and want to earn extra money, you can complete a quest and receive bonuses for each task. The tasks include subscribing on Facebook, recording a video and so on. If you want to find out more visit BtcRush website or social media profiles. Certainly, a great marketing approach - complete a task and get a reward! As a project with long-term deposit terms, BtcRush on the internet is being called a piggy bank. So, let’s take a closer look at the calculations and evaluate the potential benefit of their investment plan offer. Briefly - 4.1% a day for a lifetime with an opportunity to withdrawal the deposit anytime for a 5% fee. The min deposit $5. An investment of $200 in BtcRush would generate a daily return of $8.20 and your investment would reach the break-even point within 25 days. If you don’t withdrawal the initial deposit and decide to keep it in for a while, then within 49 days such deposit would generate a net profit of $200. If the program stays in the game for so long, then probably this one is worth considering. Sure, in the ideal world after the 49th-day initial deposit could be still withdrawn for 5% fee. These calculations are just to give you a better understanding. Feel free to do your own calculations and pick any amount you like to find out about the potential profit! Another cryptocurrency inspired program. Isn’t it hard to choose the right one! However, I am glad to see another well-designed program, which doesn’t give me that feeling of a quick and sloppy job. But as always, a HYIP is a HYIP, therefore, if you ever decide to make any investments, don’t invest more than you can afford to lose! Have you already made an investment in BtcRush and have any useful information to share with us? Please drop a message in the chat box to share your experience! Investment plans: 4.1% daily for lifetime. Principal returned for a 5% fee anytime.